The black swan metaphor for an unlikely event is usually traced back to the Roman poet, Juvenal (Decimus Iunius Iuvenalis, fl. 2nd century AD), who writes about a niger cygnus, but there was an earlier mention by Lucretius (Titus Lucretius Carus, 99 BC - c.55 BC) in book II of his "De rerum natura" where he writes how unlikely it would be that, "...Swans turn black from seed of black, or be of any single varied color you might want" ("... nigros fieri nigro de semine cycnos aut alio quovis uno varioque colore"). Other authors in antiquity, however, were more likely to write about white crows than black swans. This is probably a consequence of the paucity of swans and an abundance of crows. Juvenal, himself, wrote in his Satire VII that a "Happy man is rare - rarer than a white crow" ("Felix ille tamen corvo quoque rarior albo"). The ancient Greeks had the expression "seeing a white crow" ("λευκον ιδειν κορακα"). Not surprisingly, Aristophanes (c.446 BC - c.386 BC) mentions white crows in his play, The Birds. A black swan, Cygnus atratus. For most of history, a black swan was a metaphor for an impossibility. However, the first Europeans who came to Australia in the 17th century discovered black swans there. Cygnus atratus, which have reddish bills, are found mostly in southeast and southwest regions of Australia. To complement the ornithologists' interest in black swan habitats and migration, physicists have spent a lot of time in study of the quality of blackness and the development of very black materials. When 19th century physicists needed a very black object for an optical experiment, they would form layers of soot on glass. Soot is condensed from the smoke of incompletely combusted hydrocarbons. A well prepared layer of soot will reflect less than 1% of visible light. The 99% blackness of soot is quite black; but, as I wrote in a previous article (Very White and Very Black, November 23, 2011), a more advanced form of soot, carbon nanotubes, can do much better. Arrays of vertically-aligned carbon nanotubes are quite black over a wide range of wavelength, and they can absorb more than 99.955% of incident light at visible wavelengths. [3-4] The supposed mechanism is that the forest of nanotubes has a multitude of holes and gaps to trap light; that is, incident light must make many multiple reflections to exit. A super-black vertically-aligned carbon nanotube optical absorber created by NASA. The upper image has a portion removed to show the vertical alignment of the nanotubes, and the lower image shows the surface at high resolution. The scale bar is a 50 micrometer marker. This material absorbs 99.5% of visible and ultraviolet light, but only 98% of far-infrared light. NASA is concerned not only with the optical absorption property, but with the complementary emissivity. Super-black materials will efficiently radiate heat energy to keep spacecraft sensors and electronic components cool. "Waves that are being scattered in a complex way are really all around us - think about a mobile phone signal that is reflected several times before it reaches your cell phone... This multiple scattering is made practical use of in so-called random lasers. Such exotic lasers are based on a disordered medium with a random internal structure that can trap light and emit a very complicated, system-specific laser field when supplied with energy." As shown in the above photo, the device consists of a microwave waveguide and a central absorbing antenna filled with a random arrangement of Teflon cylinders. The cylinders act like stones in a puddle of water reflecting water waves; but, in this case, they scatter microwaves to create a complex wave pattern in which the reflected microwaves overlap and interfere with each other. This enables efficient absorption by the central antenna, and this absorption was experimentally measured to be 99.8%. Scientists at Duke University have modified a metamaterial absorber they published in 2017 to produce their own anti-laser. 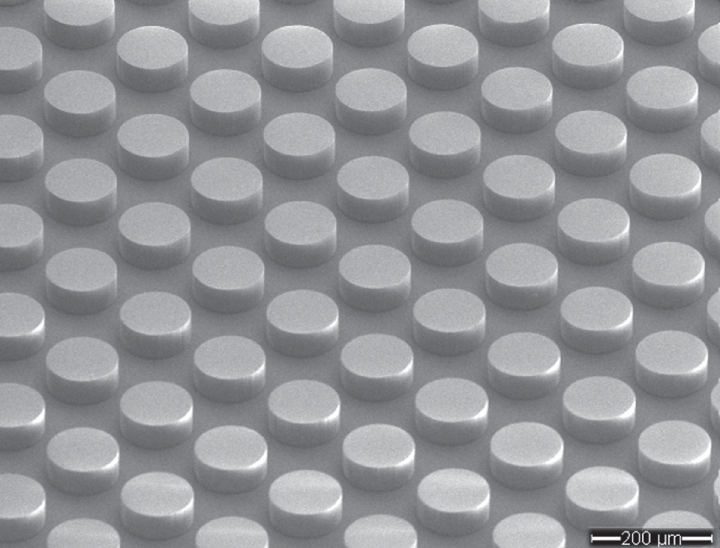 [8-9] The metamaterial is built from zirconia ceramic dielectric that had surface cylinders like the face of a Lego brick (see photo). Says Duke research leader, Willie Padilla, a professor in Duke's Department of Electrical and Computer Engineering, "We've studied this system before as a perfect absorber, but now we've figured out that this device can be configured to be a CPA as well." Duke University zirconia ceramic dielectric metamaterial absorber. As Kebin Fan, a research assistant professor at Duke explains, "Typical CPAs have only one variable, the material's thickness... We have three: the cylinders' radius, height and periodicity. This gives us a lot more room to tailor these modes and put them in the frequency spectrum where we want them, giving us a lot of flexibility for tailoring the CPAs." While the absorbance of these devices still falls short of perfection, such anti-lasers could have some useful applications, such as hyperspectral imaging and energy harvesting. They might also be important where focused energy is used, as in kidney stone lithotripsy. Nassim Nicholas Taleb, "The Black Swan: The Impact of the Highly Improbable," Random House (April 17, 2007), 366 pp., ISBN: 978-1400063512 (via Amazon). Antonio Marco Martinez, "Nihil Novum sub Sole - 1001 deeds, sayings, curiosities and anecdotes of the ancient world, Antiquitatem Website. 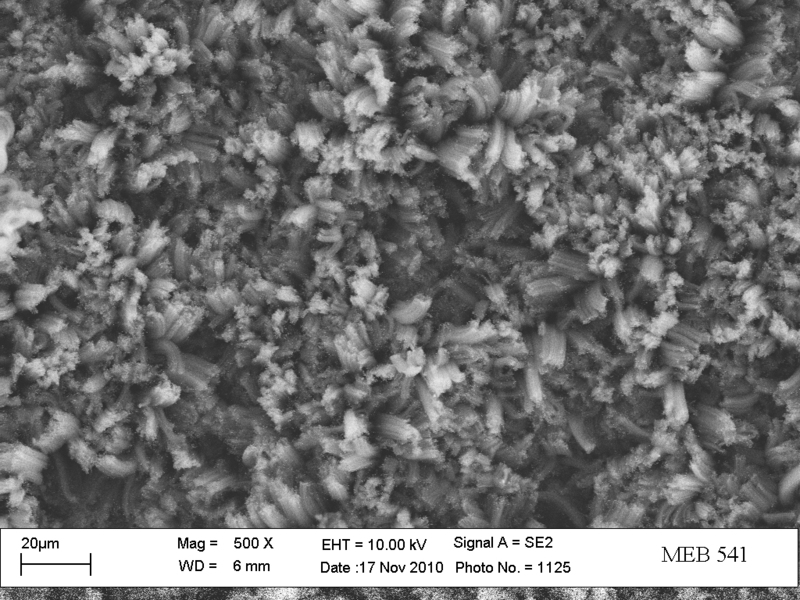 Zu-Po Yang, Lijie Ci, James A. Bur, Shawn-Yu Lin and Pulickel M. Ajayan, "Experimental Observation of an Extremely Dark Material Made By a Low-Density Nanotube Array," Nano Lett., vol. 8, no. 2 (February, 2008), pp 446-451. Kohei Mizuno, Juntaro Ishii, Hideo Kishida, Yuhei Hayamizu, Satoshi Yasuda, Don N. Futaba, Motoo Yumura and Kenji Hata, "A black body absorber from vertically aligned single-walled carbon nanotubes," Proc. Natl. Acad. Sci., vol. 106, no. 15 (April 14, 2009), pp. 6044-6047. Lori Keesey and Ed Campion, "NASA Develops Super-Black Material That Absorbs Light Across Multiple Wavelength Bands," NASA Goddard Press Release No. 11-070, November 8, 2011. Kevin Pichler, Matthias Kühmayer, Julian Böhm, Andre Brandstötter, Philipp Ambichl, Ulrich Kuhl, and Stefan Rotter, "Random anti-lasing through coherent perfect absorption in a disordered medium," Nature (March 4, 2019), https://doi.org/10.1038/s41586-019-0971-3. Florian Aigner, "The Random Anti-Laser," Vienna University of Technology Press Release, no. 11/2019, March 5, 2019. Jonathan Y. Suen, Kebin Fan, and Willie J. Padilla, "A Zero-Rank, Maximum Nullity Perfect Electromagnetic Wave Absorber," Advanced Optical Materials (January 28, 2019), Article no. 1801632, DOI: 10.1002/adom.201801632. 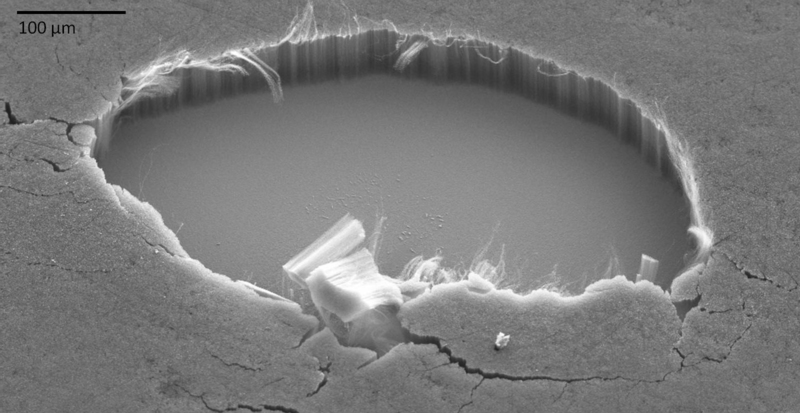 Ken Kingery, "Researchers Discover Anti-Laser Masquerading as Perfect Absorber," Duke University Press Release, February 15, 2019. Linked Keywords: Book; bookcase; bookshelf; Nassim Nicholas Taleb; black swan theory; economics; culture; corporation; corporate research; technology; technological; disruptive innovation; disruptive technology; digital photography; chemistry; chemical; photography; Eastman Kodak Company; metaphor; Roman Empire; poet; Juvenal (Decimus Iunius Iuvenalis, fl. 2nd century AD); Lucretius (Titus Lucretius Carus, 99 BC - c.55 BC); De rerum natura; author; classical antiquity; crow; paucity; Satires (Juvenal); ancient Greeks; Aristophanes (c.446 BC - c.386 BC); play (theater); The Birds; swan; Cygnus atratus; history; European; Australia; 17th century; beak; bill; southeast; compass point; southwest; Wikimedia Commons; ornithology; ornithologist; habitat; animal migration; physicist; quality (philosophy); black; blackness; material; 19th century; optics; optical; experiment; soot; glass; condensation; condense; smoke; combustion; combust; hydrocarbon; reflect; visual perception; visible; light; carbon nanotube; array; vertically-aligned carbon nanotube; wavelength; absorption (electromagnetic radiation); NASA; surface; linear scale; scale bar; micrometer; material; ultraviolet; infrared; emissivity; efficiency; thermal radiation; heat energy; spacecraft; sensor; electronic component; scientist; perfection; laser; emission spectrum; emitter; time reversibility; time-reversed; microwave frequency; random; scattering; Vienna University of Technology (TU Wien, Vienna, Austria); University of C%C3%B4te d%27Azur">Université Côte d'Azur (CNRS, Nice, France); Stefan Rotter; professor; Institute for Theoretical Physics at TU Wien; dimension (mathematics and physics); one-dimensional; two or three dimensions; disorder; electromagnetic radiation; resonance; resonant; computer simulation; experiment; experimental; wave; mobile phone; signal; cell phone; field (physics); energy; Ernest Rutherford; An alleged scientific discovery has no merit unless it can be explained to a barmaid; beer glass; waveguide; polytetrafluoroethylene; Teflon; cylinder; microwave antenna; absorption (electromagnetic radiation); microwave; stone; puddle; water; pattern; interference (wave propagation); Duke University; metamaterial; zirconium dioxide; zirconia ceramic; dielectric; Lego brick; Willie Padilla; Duke's Department of Electrical and Computer Engineering; Kebin Fan; research assistant professor; variable; radius; periodic function; periodicity; electromagnetic spectrum; hyperspectral imaging; energy harvesting; focus (optics); kidney stone; lithotripsy.